S.A Paribahan is one of the renowned services for transportation and courier service. 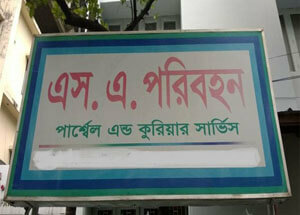 They are one of the oldest companies who started the business just after the independence of Bangladesh. The company is a sister concern of S.A Group of Chittagong. They carry the papers and parcels with a reasonable transport cost. It has more than 80 branches across the country. A study says that the company carries more than 60% papers and parcels among all other courier services. S.A Paribahan courier service is reliable for delivery time. Amin Market (Ground Floor) Khatungonj. House # A/18 T.T Road, Cornell hat, Ctg. S.A Paribahan has to handle a huge amount of parcels regularly. The service has no off day. You can get them anytime but not late night. S.A Paribahan is like a bridge between company and customers for the e-commerce industry. They are trustworthy in this sector. You can also get refund or compensation if your paper or parcel being lost. For the growing e-commerce industry, S.A Paribahan plays a vital role to bloom this industry.